We value our partnership with you and consider it essential to our work in safeguarding our community’s health. The following links represent resources you have most frequently requested. If you would like additional online information, please call or email Beth Phipps, BSN, RN, Clinical Services Manager (360) 728-2309 beth.phipps@kitsppublichealth.org. Public Health Surveillance is the collection, investigation and distribution of data about illness and death. This surveillance helps prevent and control disease and is used to protect and improve the health of the public. 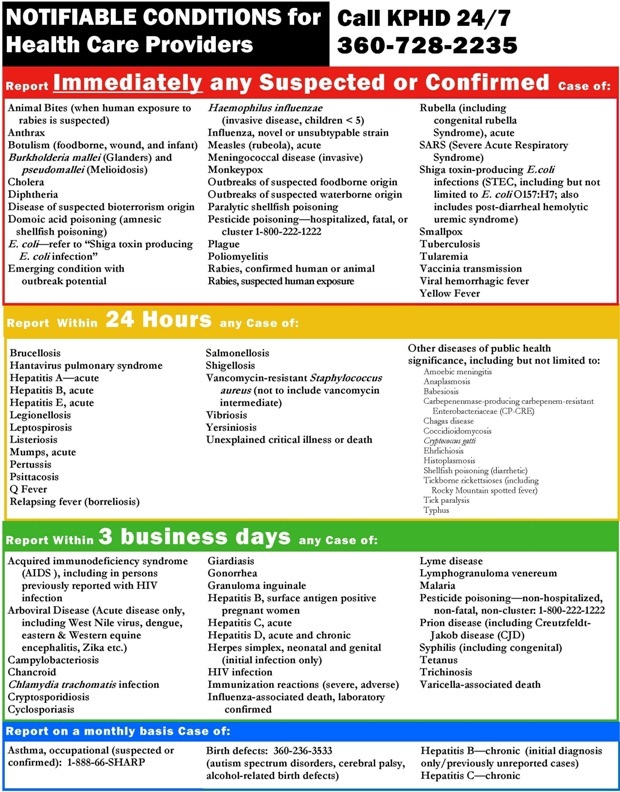 In Washington State, health care providers, health care facilities, laboratories, veterinarians, food service establishments, child day care facilities, and schools are legally required to notify public health authorities at their local health jurisdiction of suspected or confirmed cases of selected diseases or conditions. These are referred to as notifiable conditions. To report a notifiable condition 24/7, call Kitsap Public Health District at 360-728-2235.